1. What is ModelState Object? 2. How to validate input using Model.isValid Property? 3. How to display error message using ValidationMessageFor extension method. ModelState is a property of controller that is used for validating form in server side. 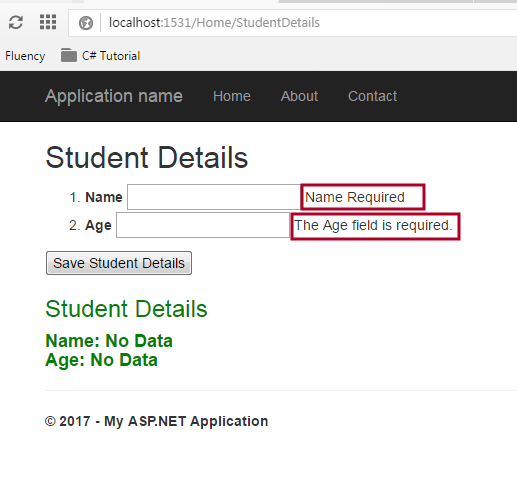 You must add System.Web.Mvc namespace in order to use it. ModelState is a collection of name and value pair that was submitted to the server during post. It also contains a collection of error messages for each value submitted. Step 1. Create a New Project or Start any existing ASP.NET MVC Project. Step 2. Add a StudentModel.cs and paste following code. Step 3. Add the following code in Index.cshtml page. Steps 4. Add following action method in HomeController.cs. Step 5. Run this Project. 1. Form is very simple and basic but you might notice that there is a new line added in form. @Html.ValidationMessageFor control display the error message for Name textbox. This error message sent from controller. 2. ModelState.AddModelError("Name", "Name Required"); - ModelState takes 2 parameter. First Parameter “Name” is a name of input control and 2nd parameter is a string error message. In this chapter, you learned how to use ModelState.isValid property to examine user input at server side. In the next chapter, you will learn Validation using Data Annotation in MVC.